Tuning forks play a central role in vibration and sound therapy. They feature healing properties that are tied to the forks’ ability to create a resonance through the mind, body, and emotions. For performing therapies with a tuning fork, we recommend the Baseline® Tuning Fork. 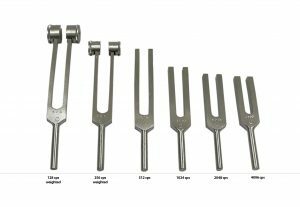 Baseline® provides various weighted and unweighted tuning forks for evaluating hearing and vibratory sensation. Weighted tuning forks have a round weight at the end of each prong. The heavier the weight of the tuning fork, the stronger or heavier its vibration will be. Heavier vibrations bring a more pronounced feeling when the stem is placed on the body. This could help reduce inflammation on the affected area and relieve pain. With unweighted tuning forks, the difference lies in the intensity of the vibration. Unweighted tuning forks are used more for hearing evaluation as they do not provide the same frequency as weighted tuning forks. As mentioned earlier, the heavier the fork weight is, the more powerful its vibration. This applies to unweighted tuning forks as well. Since they do not really have a weight to them, these forks do not have as powerful of a vibration. This makes them more ideal for hearing evaluation. Each tuning fork is labeled by its CPS, or cycles per second. This is the measurement for the frequency of vibrations. A 64 cps tuning fork will vibrate 64 cycles per second. Higher frequencies do different types of tests. Some tests require a higher cps to be an effective test. Baseline® Tuning Forks provide accurate measurement results in both sensory and auditory diagnosis. They come in all shapes and sizes to provide the very best selections to doctors in the auditory and evaluation field. To check out our selection of tuning forks, click here.